May 21, 2009 marks the release date from the US Mint of the John Tyler Presidential $1 coin in uncirculated condition. The proof version is already available in proof sets. This coin is meant to honor the tenth President of the United States, a man who served his country throughout his life and achieved many firsts during his presidency. Tyler, trained as lawyer served in political offices in his home state of Virginia, as well as in the United States House of Representatives and the United States Senate. Then, in 1840, he became the vice presidential running mate of William Henry Harrison, known as "Old Tippecanoe" for his victory at the Battle of Tippecanoe. Harrison and Tyler used the slogan "Tippecanoe and Tyler Too! ", a move that helped to propel them to victory. Harrison would only serve as president for 32 days before dying in office. Presidential succession had not been tested up to this point, and Tyler became the first man to assume the Presidency upon the death of his predecessor. This was not without its problems however, as many felt he should assume the duties of the president, but not the office. He became known by many as "His Accidency", a term that did not stop him from performing his duties as he saw them. Expelled from the Whig party for not following its platform, Tyler also vetoed multiple bills offered for his signature. Up to this point, most presidents vetoed bills based on its constitutional merit, but Tyler vetoed many for political reasons. This led to the first impeachment proceedings ever started against a president. The impeachment was not successful, however, and Tyler would continue his policies. Without an established political party, Tyler was unable to achieve re-election and went back home to Virginia. For several years, he stayed out of the political forum, but returned to it in 1861. An avid supporter of State's rights, Tyler was elected to the House of Representatives of the Confederate Congress during the Civil War, but died before he could attend. His status as a confederate during his death meant he would be the only president not to be officially mourned in Washington D.C.
Phebe Hemphill designed and sculpted the obverse of the Tyler Presidential Coin. 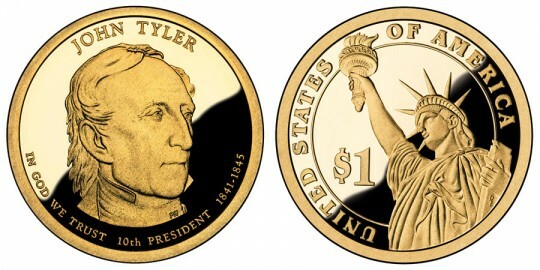 It features an image of John Tyler along with the inscriptions "John Tyler", "10th President", "In God We Trust", and "1841-1845."